This might just be the most desolate alley in Denver. Under the Evans Avenue Bridge and a stone's throw from the railroad tracks, this is an absolutely forgotten urban place, complete with the requisite tires, mattresses and beer bottles amidst the waist-high tumbleweeds. Elfreth's Alley, Philadelphia. Photo by Kjetil Ree. The word alley is more than 600 years old, owing its origin to the French alee, meaning 'walking or passage,' and aler, or 'go.’ Walking and going are rarely what modern alleys are all about -- but they inherently remain passages. It follows that many cities are trying to activate -- or re-activate -- their alleys and make them human-scale places, sometimes with restaurants, retail and outdoor art. Cities from Los Angeles to Washington, D.C., are activating alleys for temporary special events as well as making aesthetic and functional improvements for the long haul. At the intersection of the five alleys, an overgrown parcel caught Wright's eye. "This green space was covered with trash and weeds that became trees -- they were literally 30 feet high," he says. "That got my mind moving." Five Points Alley during clean-up. Walking to work every morning, "I noticed the alleys and started walking through them," Toole explains. “You are in kind of a different world in an alley. It's a real genuine experience of a city." Seattle's Firehouse Alley. Photo courtesy Daniel Toole. Today he's studying urban design at Harvard and designing "a totally new pedestrian alley” for a Florida developer who contacted him through his blog, featuring "retail, restaurants, multiple levels and terraces." Others are seeing the big picture. Midtown Detroit has announced plans for four more green alleys. 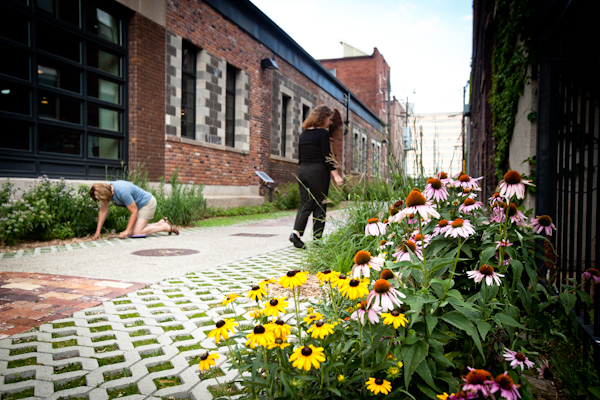 Claire Nelson and Francis Grunow of Model D have argued that the first Green Alley should be the centerpiece of an entire walkable "Alley District” in Midtown. In Minneapolis, writer-artist Andy Sturdevant exhibited his "Alley Atlas” at the Minneapolis Institute of Art in late 2013. Looking at the city's omnipresent alleyways, he says he thought, "What if we could name Minneapolis' alleys?" Alley Atlas. Photo by Andy Sturdevant. Sturdevant says most alley activation in Minneapolis is informal, including "an ongoing poster show” by local designer Erik Brandt, gardens and play areas for kids. Not that this is new: It's just a return to form. "The way it works in this jurisdiction is that it’s a public space, but we are responsible for maintaining it," says Shervin, noting that enhancements can't interfere with the alley's utility. "It's used for truck access for the office building next to us, as well as the loading for our apartment building. You suddenly become very limited." Brewer's Alley at the Rialto Cafe in Denver. Downtown Denver Partnership is working with a University of Colorado at Denver class that's developing a plan and three pilot concepts for Denver's downtown alleys. The class will unveil its plan to the public on May 13 in an alley behind Larimer Square. The City and County of Denver are also developing a master plan for alleys due in June. But "trash is a big one," he adds, because Denver's municipal service does not serve downtown -- several private companies handle that detail, meaning there are several garbage trucks that need access, not just one. He points north to Fort Collins, Colorado, where a program consolidated trash pickup and beautified the alleys, catalyzing private investment in alley storefronts and patios. Eric Peterson is a Denver-based writer and editor specializing in technology and travel. He's written about music for Westword, skiing for the New York Daily News, and tech startups for Confluence Denver, while authoring dozens of guidebooks for Frommer's Travel Guides. He's also written his own Ramble Guides series, including Ramble Colorado. Contact him here. Comments? Contact 83 Degrees.